Caption slip reads: "Photographer: Snow. Date: 1951-09-14. Reporter: Dunn. Assignment: Boy Drowns in Reservoir. 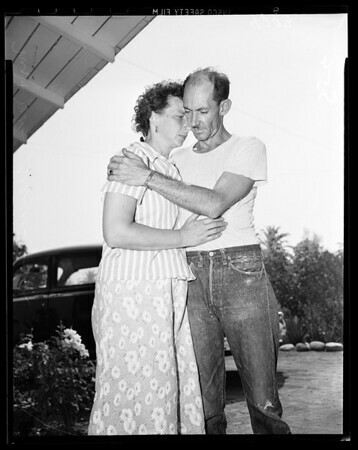 29/30: copy of pix of William A. Lyon, 8, who drowned in irrigation reservoir. 27/28: Anna Lee Lyon, 10, comforts Naomi Lyon, 5, who was with her brother when he fell in reservoir. 83/84: Victor Rodriguez, 26, points to hole in fence around reservoir. He dove in pool to search for boy. 55/56/87/88: Bereaved parents, Mr. and Mrs. Glenn Lyon".